At Express Sewer & Drain, we specialize in ALL matters plumbing, drain cleaning and pipe repair. This includes those that commonly affect commercial properties, including drain clogging, leaking fixtures and water line damage. We help our commercial plumbing customers by providing not only the best solutions for their needs, but also the most affordable, energy efficient and — above all — safe. Outdated plumbing practices often used for commercial projects, such as dig-and-replace pipe repair, can wind up costing you thousands in excessive labor, materials and property damage. This is why we use dig-free trenchless technologies in our commercial pipe renovations. With liquid-PVC liner solutions, we can effectively seal over any commercial pipe damages in-place, and avoid expensive digging or pipe replacement that would otherwise be necessary. Cured-in-place pipe is the most efficient pipe repair solution for businesses and commercial customers on the market. Modern repair technologies make the hassles and frustrations of traditional pipe repair entirely avoidable. 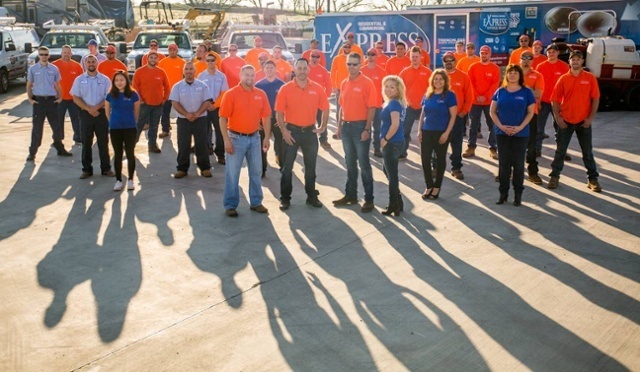 The team at Express Sewer & Drain has many years of experience in general plumbing and drain cleaning for commercial properties. It’s for this reason that we charge by the project and not by an arbitrary hourly rate. We make it our commitment to resolve the problem at hand, no matter how long it takes. We never shy away from a challenge. Whether your commercial plumbing needs are minor or severe, we will work diligently in each case to restore your plumbing quickly and at a fair cost.